Am I the Only One Who Loves the New Buck 112 Slim Ranger Pro? Win $5,000 toward your dream adventure and a NordicTrack to help you train to achieve it. Expert reviews, news, and advice. Brought to you by Argo XTV. From next-gen tech to ingenious innovation, our weekly peek at emerging products examines the sometimes cutting-edge, sometimes quirky world of gear design. Our weekly column finds the best deals from across the web to save you money on outdoors gear. Can Thule ‘One Up’ the Competition With the Helium Platform? Support us! GearJunkie may earn a small commission from affiliate links in this article. Learn more. 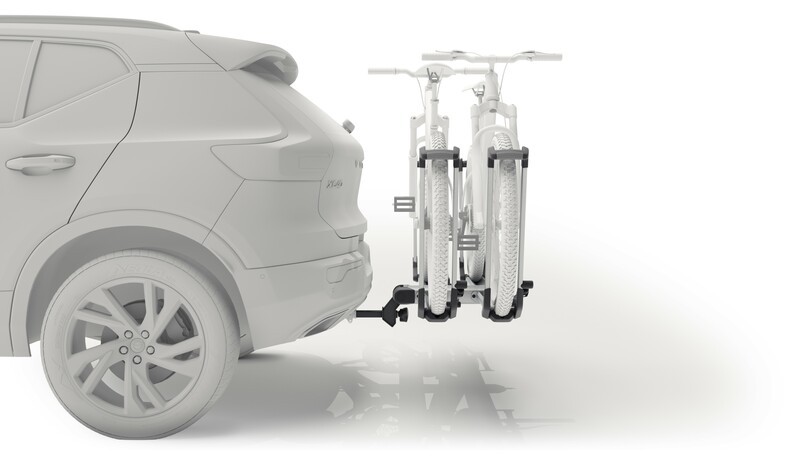 Thule has once again stepped up with a quality, super convenient way to transport your bikes. 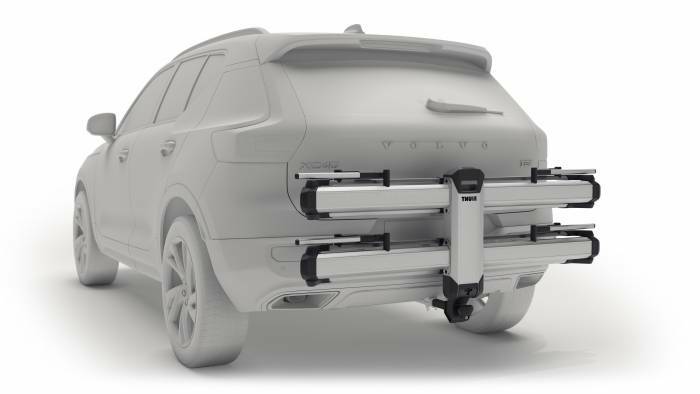 The new Thule Helium Platform is a hitch-mounted bike carrier that holds bikes in place without any contact with the frame. Keep that shiny bike shiny! Thule is always looking for new and innovative ways to improve security and convenience when carrying gear on your vehicle. The latest hitch-mounted bike carrier, the Helium Platform, was just shown for the first time at Interbike. It makes carrying your bike super easy, secure, and convenient. While an innovative design, this style of bike carrier isn’t an entirely unique idea. This style of wheel-compression hitch bike rack will be familiar to many enthusiasts, as it is the same style the brand 1Up has pioneered since 2001. 1Up bike racks have become extremely popular with core cyclists for their burly construction, ease of use, and secure design. The real killer feature of this style of rack is that the bike is secured by compression on the wheels, not on the frame. This is especially important on high-end and custom-painted bikes. Nobody wants wear or scratch marks from transporting their bike! The ratcheting wheel loops quickly and easily hold bikes onto the rack securely. Holding the bikes by the tires ensures the bike frame doesn’t come into contact with the rack. This prevents the rack from scratching or damaging the frame and allows it to hold a wide range of bike styles. The Thule Helium Platform works with all 1.25- and 2-inch hitch receivers. It will hold up to a 50-inch frame and wheel sizes from 26 to 29 inches. The rack also accommodates up to a 3-inch-wide tire and can carry up to 37.5 pounds per bike. The weight and tire size limits will rule out carrying many e-bikes and all fat tire bicycles. The frame length restriction also rules out carrying tandem bikes, chopper-style cruisers, and many utility bikes. The Thule Helium Platform is made of lightweight aluminum and should come in a bit lighter than other traditional hitch-mount bike racks, or at least we hope so with a name like “Helium.” No official product weight numbers have been released just yet. 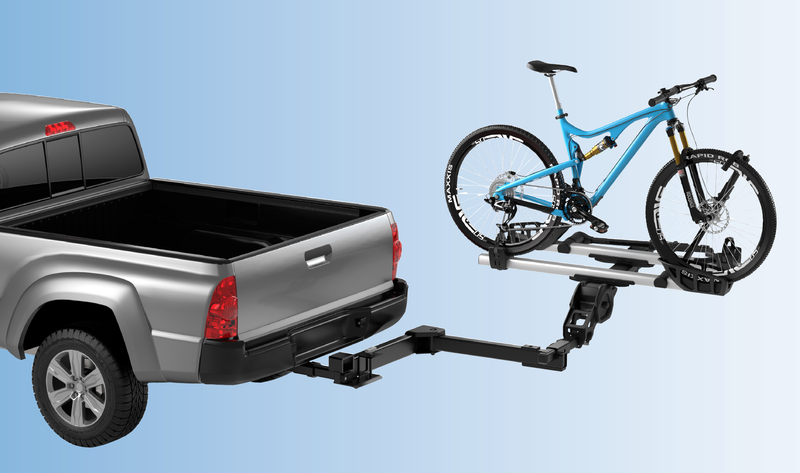 This rack folds up super compact, which is great for both storage and minimizing vehicle length when left installed. 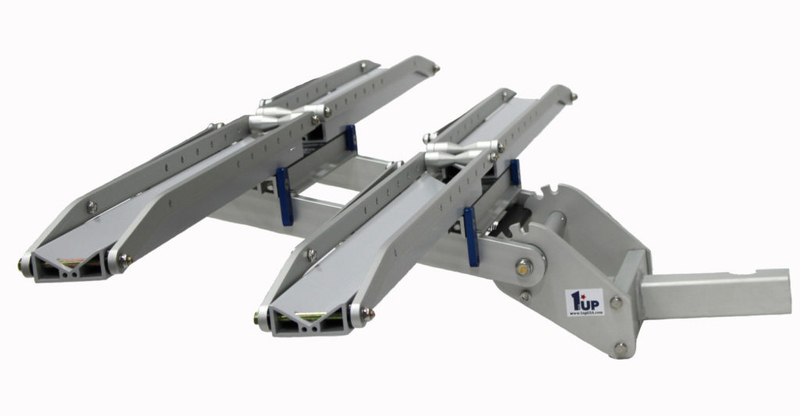 It can also tilt down, even when loaded, for better rear access to your vehicle. Integrated and included cable locks in the Thule Helium Platform ensure your bikes are secure. 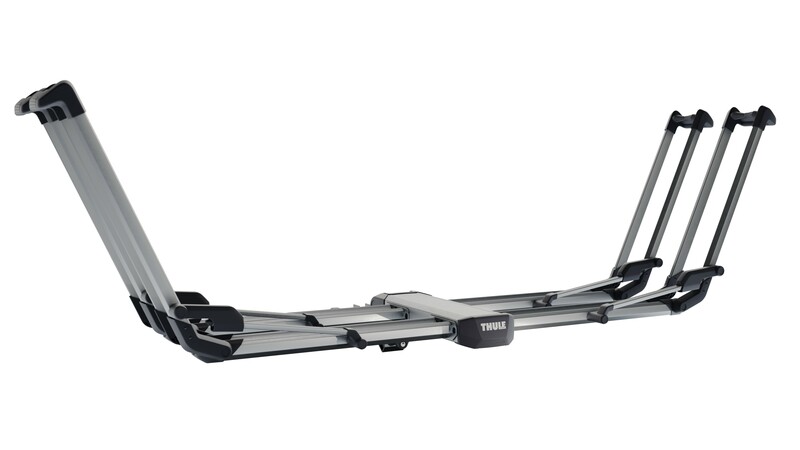 The Thule Helium Platform single-bike carrier will set you back $429.95 while the double-bike carrier will come in at $649.95. Sadly, we’ll all have to wait until May 2019 to get our hands on one of these. Another great hitch-mount accessory just released by Thule is the Access, a swing-away adaptor for any hitch-mounted rack. 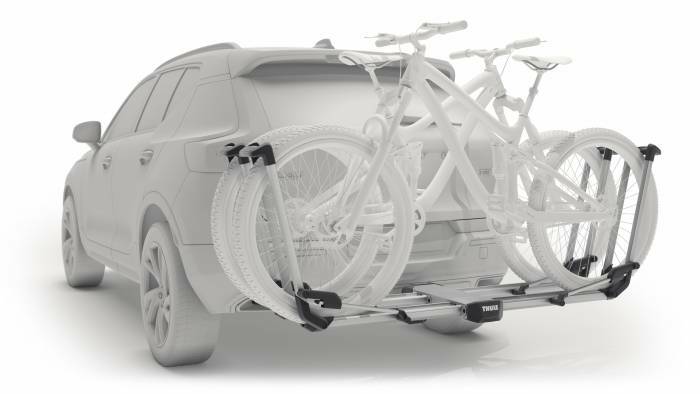 The Thule Access offers full access to the rear of your vehicle, even with bikes loaded. The Thule Access will pair perfectly with the Helium Platform and retail for $299.95. From mtb to cyclocross, fixies to road bikes, we review the greatest new bike gear. Get the latest outdoor & adventure news thrice weekly. Subscribe By April 30 For Your Chance To Win! La Sportiva's Kaptiva trail running shoe has the perfect balance of protection, cushion, stability, and traction. GearJunkie: The Authority on Outdoor Adventure and Gear. ©2019 GearJunkie LLC All Rights Reserved.